How to fix Baltimore: Lower its property taxes. Start by lowering its property taxes. 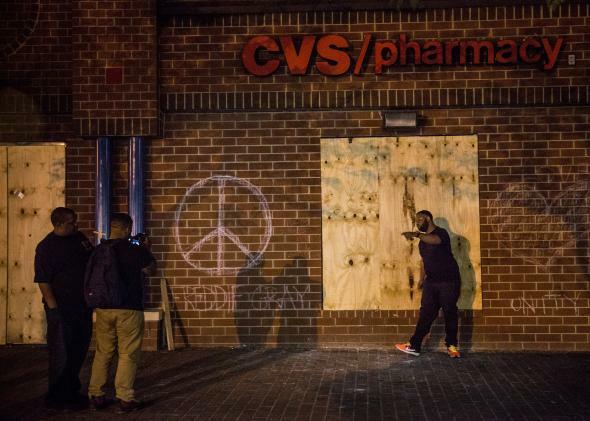 A music video is taped in front of a CVS that was looted days earlier in the Sandtown neighborhood where Freddie Gray was arrested, on May 3, 2015 in Baltimore. Can Baltimore and cities like it ever become good places to raise children? In the days since Freddie Gray’s death, there has been a great deal of discussion of police brutality, and for good reason. Yet there have also been questions about why large swaths of Baltimore are so persistently poor, and why children who grow up in the city’s poorest neighborhoods grow up to be poor themselves. The Harvard economists Raj Chetty and Nathaniel Hendren have recently released a study that finds that poor children raised in Baltimore City earn $4,510 less per year as adults than poor children raised in an average U.S. county. Are Baltimore’s public schools unusually bad? Or is it that Baltimore’s low-income families don’t get the help they need from the government, while those living in the suburbs do? Is there something uniquely destructive about the culture that prevails in these communities that fades once families move just a few miles away? I’m sure there’s at least something to each of these explanations, but there is another problem that deserves consideration: Baltimore’s high property taxes are keeping the city poor. That’s right. If you want to make Baltimore more livable for poor children, cutting property taxes could be the best bet. To understand why Baltimore’s property taxes might matter, it is first important to understand the mounting evidence that poor children benefit from growing up in non-poor neighborhoods. Chetty, Hendren, and their colleague Lawrence Katz draw on the Moving to Opportunity, or MTO, experiment, an ambitious effort to gauge the effects of neighborhood environment on long-term life outcomes for poor children. The experiment was designed to gauge whether moving families from a high-poverty neighborhood to a low-poverty neighborhood yielded significant gains for children over the long term, and the answer appears to be yes. Children from families that moved to low-poverty neighborhoods earned 31 percent more than those from families in the control group, who remained in their high-poverty neighborhoods. If these findings aren’t reason enough to be concerned about the effects of being raised in a high-poverty neighborhood, the NYU sociologist Patrick Sharkey, author of Stuck in Place, has found evidence that these negative effects can be transmitted from one generation to the next. In other words, when we do nothing about the concentration of poverty in a given neighborhood, we’re not just damaging the lives of the children who live there today—we’re damaging the lives of their children. We can’t say definitively why this is the case, but one plausible explanation is that when poor kids interact with kids from better-off families, they’re in a much better position to learn about opportunities for advancement and to take advantage of them, and these effects build from generation to generation. So what does all this have to do with property taxes, you ask? If our goal is to reduce the concentration of poverty in the worst-off neighborhoods, and to encourage the kind of class-mixing that might better the lives of poor children, we can either give poor families the resources to move out or convince better-off families to move in. Moving poor families out doesn’t require property tax cuts. Convincing better-off families to move in probably does. To pursue the move-out strategy, we could use MTO-style housing vouchers to help children escape to better-off neighborhoods. But of course we can’t force families to leave these neighborhoods, to which many residents are strongly attached. To do so would be illiberal in the extreme. Moreover, given the sheer number of families living in high-poverty neighborhoods in Baltimore, there might be some practical limit to this strategy. The MTO experiment tracked roughly 4,600 families in five U.S. cities. It’s not at all clear that an MTO-style approach would work if we scaled it up to, say, 40,000 families in one city. Transforming poor neighborhoods into mixed-income ones isn’t easy either. Once the process takes hold, however, it can gain strength over time. Because middle-income families tend to have stronger social networks, they’re in a better position to fight for improvements in local schools and better policing. The question is how to get this process started. At a bare minimum, cities like Baltimore have to ensure that families (and businesses) that choose to invest in the city will earn a decent return on that investment. In his 2014 book Boom Towns, Stephen J.K. Walters, an economist at Loyola University Maryland, tells the fascinating story of Boston in the first decades of the 20th century, when a charismatic Irish American mayor, James Michael Curley, built a powerful political machine in part by hiking property taxes. High property taxes financed a big expansion in the number of public employees, virtually all of whom were politically loyal to Curley. They also drove out Curley’s political enemies, the affluent Boston Brahmins who resented having to pay higher taxes. Because Boston’s higher taxes didn’t finance better public services—if anything, the quality of public services deteriorated over time—the Brahmins decamped for Boston’s suburbs, where the same investment in property would yield much higher after-tax returns. This wasn’t the only reason Boston’s old-line WASPs were rushing for the exits, to be sure, but Walters argues persuasively that it was a big part of it, and he points to the fact that similar cities that had much lower per capita property tax burdens in that era saw their populations grow, not shrink. You could say that Boston was experiencing “white flight,” only Boston’s better-off families were fleeing other white people. Eventually, Boston recovered. Since the early 1980s, Boston has seen an extraordinary revival as upwardly mobile families have flocked to buy and restore many of its handsome old houses. Indeed, Boston’s biggest problem is arguably that it’s become so attractive to affluent families that many low-income families are getting priced out. So what changed? For Walters, it is no coincidence that Boston’s property boom followed a statewide cap on property taxes that went into effect in 1982. Homeowners no longer feared that their property taxes would increase without limit, so more and more of them were willing to invest. While Boston lost 30 percent of its residents between 1950 and 1980, it gained 5 percent over the next two decades and the median household income in the city increased 38 percent faster than the national average from 1979 to 2005. The result is a city that is hardly a utopia yet has a far healthier mix of rich and poor than cities like Baltimore. Chetty and Hendren find that poor children raised in Suffolk County, Massachusetts, which is dominated by Boston, earn $840 less than the U.S. average as adults, or $3,670 more than their counterparts in Baltimore. When the Massachusetts property tax cap was being debated, many feared that cities like Boston would be starved of revenue as services collapsed. Instead, a rush of new investment and economic activity led to healthy increases in property tax revenues. Even more egregious is the effect of property taxes on business investment. The great advantage of cities over smaller communities is that cities are essentially big accumulations of capital. Workers in Boston earn more than similarly educated and motivated workers in rural Massachusetts because they’re surrounded by other workers from whom they can learn over time but also because they have access to lots of useful stuff, like office buildings filled with desks and computers and warehouses with forklifts and cranes. If you raise taxes on useful stuff, which is to say capital goods, too high, however, business owners will start spending money on capital goods in other jurisdictions, where they can get a better return. Think about the effect this has on a city like Baltimore, which has large numbers of less skilled workers. If these workers had access to capital goods, they would produce more and they would command higher wages. But because Baltimore’s high property taxes discourage capital investment, their productivity levels remain low and so do the wages employers are willing to pay them. In “How to Make Baltimore a Superstar City,” a 2010 essay published in the Maryland Journal, Walters and his co-author, Louis Miserendino, offer a plan of action for Baltimore. They call for revising the city’s charter to guarantee that property taxes would be cut three years in the future to a level just below that of suburban Baltimore County, and for raising property taxes only with a supermajority popular vote. Since Walters and Miserendino anticipate that property values would immediately rise, and that investors would flock to the city in large numbers, they call for reserving higher-than-inflation increases in tax receipts to a “lock box” that would be drawn upon once the property tax cut went into effect, to provide a cushion against any short-term revenue shortfall. Over time, if Walters and Miserendino were right, Baltimore would grow far more attractive to middle-income families and to businesses looking to make significant capital investments. Baltimore’s workers would be better off, as they’d have more capital to work with, and its poor families would be less isolated as high-poverty neighborhoods slowly became mixed-income neighborhoods. Keep in mind that Baltimore’s city government already uses property tax cuts to attract investment. The problem is that they do so selectively by extending tax breaks to politically connected developers for projects that tend to be built downtown. Walters and Miserendino’s approach offers the same favorable tax treatment to all investors, whether they’re families looking to buy a home or large-scale developers. Cutting property taxes is far from the only thing Baltimore needs. Higher-quality public services would do a great deal of good—particularly better policing. MTO-like programs that help poor families move to better-off communities in the suburbs or beyond are worth investing in too. Yet if Baltimore is to have a future, it must become a place that attracts rather than repels investment, and lower property taxes are an excellent way to achieve that goal.